Heavy Metal has always done basic machining. We continue to update our machines and capabilities to add to the list of services for our customers. One area that we have on our “Special Projects” list is the AR- Rifle. Our cnc mill is up and running and looking for your special project! 6.8 SPC – Now I know what all the fuss is about. We’ve done a few. AR Performance are the people to see for barrels. 7TCU Single Shot: Neat upper if you shoot the 7 TCU $300 ready to go. New/old wildcat – reamer made, blanks are here…..
50 cal Black Powder – Man, this thing gets some strange looks. Spare, spare time project. Uses brass case to hold the primers. 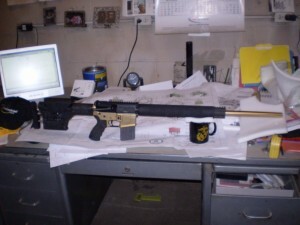 and the BIG GUN: 50 BMG – A Bohica Arms FAR50 upper, custom lower, PRS stock and 16x Super Sniper ! Visit our AR Page for details !!!!! !